I have found more evidence that appears to prove my narrow column over full screen design theory found in my design that sells post. 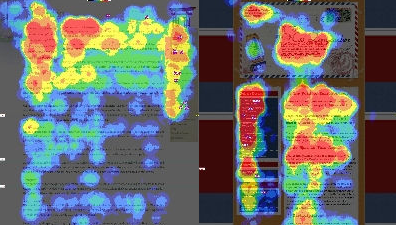 Eyetools Research of CSS Zen Garden shows the difference in how users read web pages based on design. The content of the two sites are exactly the same. Only the CSS has changed, which makes it a perfect experiment! You can see in the picture below that the original layout(left) gets much less attention than the version 145(right). I would hypothesize that Version 145’s use of the fixed width column has a lot to do with its increased attention. In the picture below you can see how the narrow column seems to guide the eye toward the content and thus focus the user’s attention. One example of a narrow column layout I used can be seen on my Wholesale Silk Fabric Site. I got the layout from OSWD and it is getting a really high CTR so far. This entry was posted on Friday, January 13th, 2006 at 4:55 pm	and is filed under Design, Niche Marketing. You can follow any responses to this entry through the RSS 2.0 feed. You can leave a response, or trackback from your own site.